The Secret Language of Flowers and studies in floriography will sometimes include mushrooms, symbolizing suspicion or even solitude... but I have never met a mushroom I did not like. Most of the edible ones I enjoy, including the wild varieties and the poisonous fungi and lichen still have a charm and aesthetic quality that has always been attractive-probably the bright color and presence in pop culture over several decades. 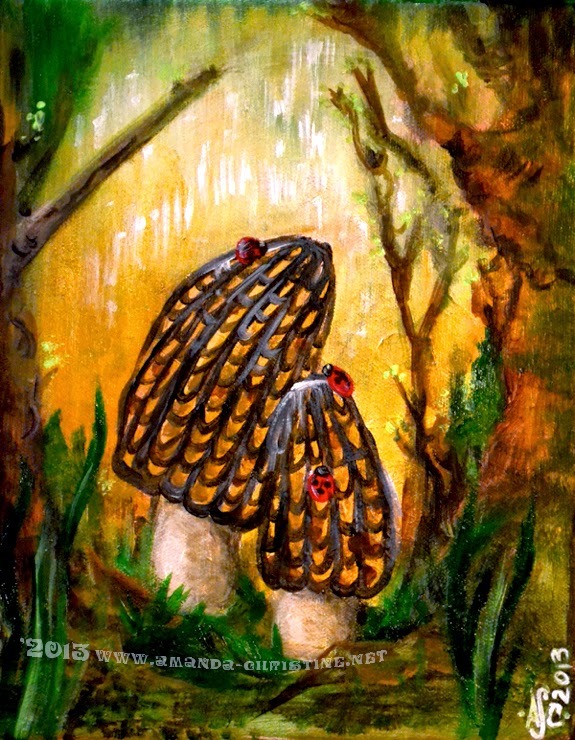 One online commenter in another group of fungi lovers posited a collective consciousness of mushroom memory images giving rise to a new trend in contemporary images using fungi shapes. 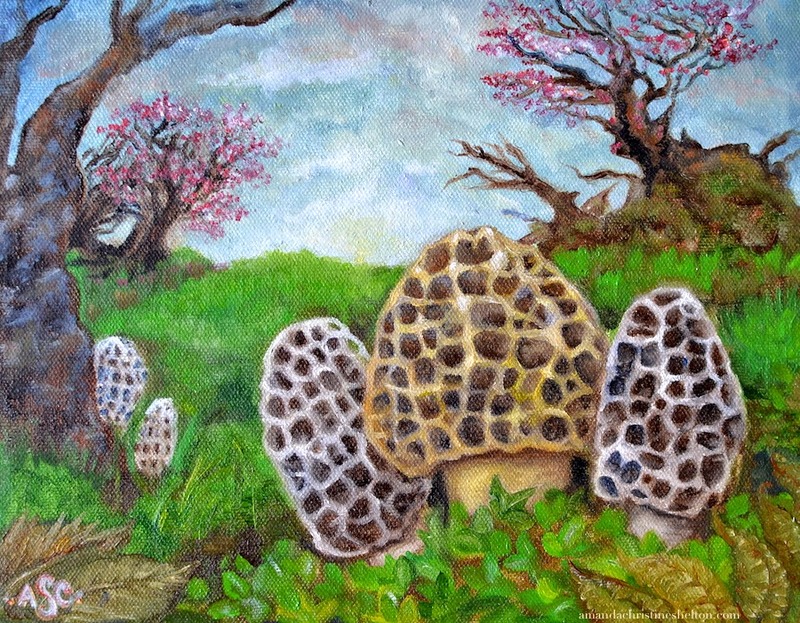 Since I have been back to my morel hunting I have been painting mushrooms again, and have some available for sale in original art and prints. 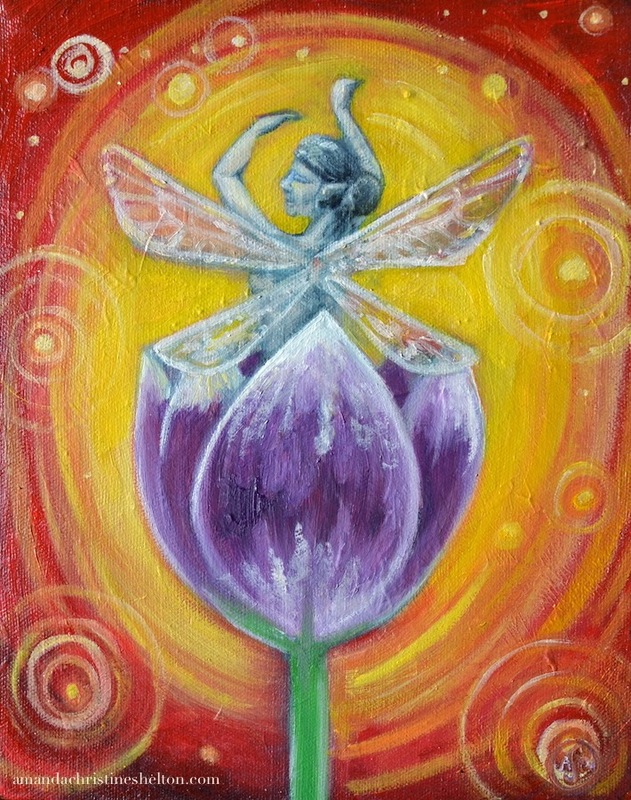 A spring fairy-type painting was also complete recently in oil... something a little brighter for me with a different type of composition. Oh ya.... speaking of studio move... we are looking at purchasing our very first house! Hooray and happy dances and no more renting!! I have been spending a lot of time in this studio in this building that is wedged between developing districts of art and entrepreneurship and some days I have felt like a nervous cat... so nervous that I have jumped on pretty much any opportunity that came along that seemed like it suited me, without even considering if it would make me happy in the long run or even if it was a step forward in my career as an artist... and when I jumped on these all-too-quick decisions suddenly others involved started making decisions for me, removing my agency as a businesswoman and a professional and a human just trying to get by and do my thing in the world with other humans. One could attribute this to being around so much aspirational energy but who knows, I really do think I could just be a sucker for charismatic startup pitches and anyone who name-drops anyone I barely know. It'll pass. 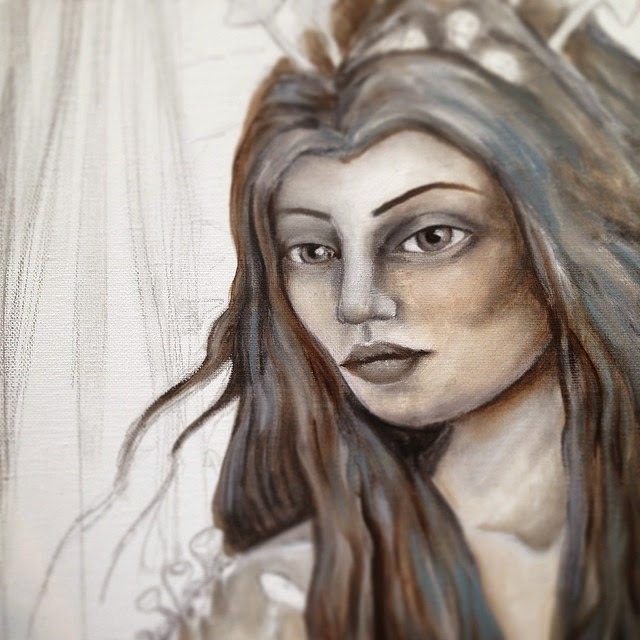 In the meantime there is a lovely Arts Festival to attend this week and that is where I think we will be!